We are involved in 2 separate events related to the remembrance of Hiroshima and Nagasaki. Peace arises from hearts that are open. At the 24-Hour Interfaith Chant for Peace, chanters from many religious traditions lead a continual flow of chants for peace, providing opportunity for people of diverse faiths to enter profound sacred space together. Great Vow invites you to add your voice to the interfaith community of those dedicated to non-violence in the world. Come for a few hours or the full twenty-four. They offer a 24-hour buffet and beds for napping. There is no charge for this event. Donations are always welcome. Great Vow Zen Monastery is located in Clatskanie, OR, about 75 miles northwest of Portland in the beautiful Columbia River valley. For information about the monastery see http://www.greatvow.org/. For driving directions, go here. Iran and the U.S. are engaged in a nuclear showdown. Instead of meeting face to face with Iran to negotiate peace and mutual security issues in the Middle East, the administration insists on preconditions to talks and threatens to lead us into another military fiasco against the advice of our own military advisors. We must take a stand agains nuclear weapons. This year's memorial features Oregon's Poet Laureate, Lawson Inada. Rev. 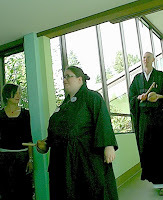 Akahoshi from the Nichiren Buddhist Temple will do the Closing Reflections. Northwest Tibetan Cultural Association Chanters will perform and Aurora Chorus will sing peace and remembrance songs. In addition, this year's memorial will be followed by a performance piece called Harmos. Follow this link for more info, and to help Oregon PSR distribute fliers. Portland's fourth annual Buddhist festival features talks by Reverend Jundo Gregory Gibbs of the Oregon Buddhist Temple, and Professor James Blumenthal of the Maitripa Institute. While talks, ceremony, and panel discussions occur in the park's main shelter, the children's pavilion has story times and activities scheduled during the afternoon. The paths of Buddhism are diverse. All are meant to lead to liberation and compassion. Buddhist communities offer booths with information about their temples. In this fourth year of the festival in the park, new features are added to celebrate, connect, and learn about the all-encompassing paths of Buddhism. Restaurants will provide food for sale, and Buddhist items will be for sale from TibetanPrayerflag.com (Tibet Gift) and Buddhist Peace Fellowship.